In May 2017, I had the pleasure of speaking with Samantha Parsons from UnKoch My Campus, a non-profit organization with a particularly tricky mission: organizing, empowering, and arming members of university communities with the information, tools, and support they need to uncover and untie their classrooms and research from partisan and agenda-setting private funding. I knew very little about their work and the challenges they face before conducting this interview. What I learned—as my reactions below might suggest—is troubling and complicated. American colleges and universities rely heavily on private donations, and the need for funding is only escalating.1 Thus, academic giving remains an admirable and important form of philanthropy, benefitting both students and myriad advances in research. What Ms. Parsons described, however, is not the business of giving as usual. Leah Meisterlin: Could you begin by you summarizing what UnKoch My Campus does? Samantha Parsons: At UnKoch My Campus, our goals are two-fold. First, we want to expose what the Koch network is doing within higher education—what universities they are funding, why they are funding them, the gift agreements to programs they are funding, and what these programs are producing. Instead of saying, “We are super nice and we want to give you millions of dollars for nothing,” the gift agreements that we have been able to access—and a lot of them are kept private by the universities—attach pretty detailed stipulations about what the Charles Koch Foundation expects in return for their donation. Often, those stipulations violate academic freedom and faculty-governance principles on campuses. The Charles Koch Foundation often has control or influence over faculty hiring, sometimes with the ability to veto potential hires. They have had influence over curriculum development, with the power to review research before it’s published. That was a big issue at Florida State University, which is probably the most egregious gift agreement we’ve been able to find. We want to see what programs the Koch Foundation has funded in the past and what are they funding currently. They have been significantly ramping up their funding since 2005. We keep track of that. I get Google alerts in my inbox constantly, every time a news report is published about a new university being funded by them. We also—and this is the second campaign-oriented part of our mission—want to work with students and faculty to help them prevent a problematic gift agreement from being accepted and advocate for policies that give faculty oversight of those private donations. LM: You said you graduated from George Mason University last year. Can you speak to how you got involved in this campaign and what you’ve been doing since? What is George Mason’s relationship to Koch funding? SP: Absolutely. I was a freshman when I met a faculty member at George Mason who had been very interested in our university’s relationship with the Kochs. The story about the gift agreement with Florida State, the one that I mentioned earlier, broke one year before, in 2011. That is when details came out about their vetoing of faculty hires and influence over curriculum. This faculty member, who knew George Mason had received quite a lot of money from the Kochs, and several other faculty members had formed a working group to investigate Mason’s relationship with private donors. They were largely blocked by the university from conducting that investigation because although George Mason is a public university, all of our gift agreements with private donors are made by our GMU Foundation, which does all the private fundraising for the school. LM: Just to clarify: we are talking about a registered non-profit foundation that has a relationship with a public institution. The private fundraising happens through a 501(c)(3), effectively. LM: We are playing the follow-the-money game. SP: Yes. Ultimately, the faculty at George Mason wanted to see the gift agreements that the university had with the Koch Foundation, just like the one made public at Florida State. They were told that the university, even though it is public, doesn’t have access to those gift agreements. That’s the foundation’s job. They don’t have to talk to you about this information, and they don’t plan to—out of respect for the donor’s confidentiality. The faculty committee was largely shut out from their investigation. When the students learned about this, we wrote our own freedom of information request and submitted it to the university. The university denied our request. So, we started a big public campaign. When I say “we,” I mean the students. When I say “students,” there were four of us, really, leading the charge. We wrote an open letter to our president, saying that it was problematic that public-university students weren’t given the opportunity to know who was funding their education, and that faculty were largely being shut out of the process as well. We made it clear that we’d like to meet with the president to understand this a little bit better. 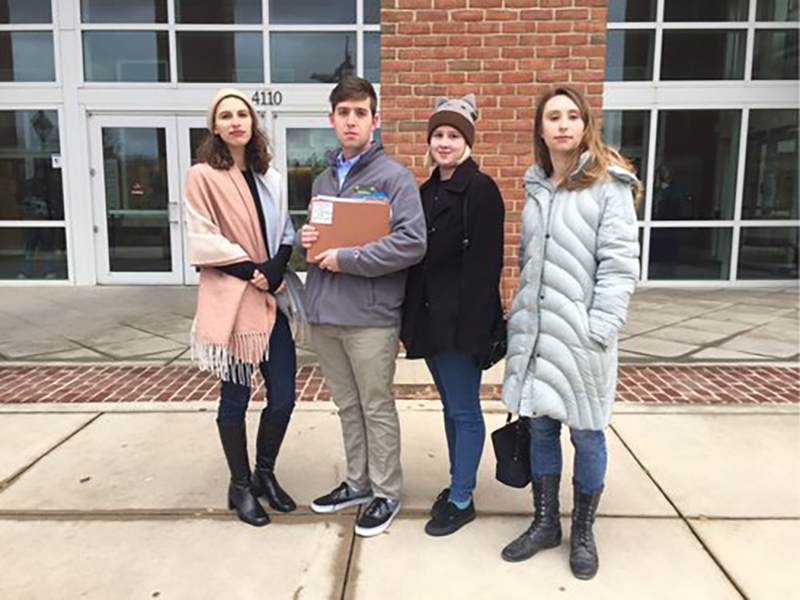 From left to right: Janine Gaspari, Gus Thomson, Molly Reagan, and Liz Mathews of Transparent GMU outside of the Fairfax Circuit Court before filing their lawsuit against George Mason University and the GMU Foundation. We were completely ignored during that process. A few weeks later, the president wrote a blog post about how much he loves private donors and how important they are to the university. He never actually addressed our letter. From then on, to speed up this long story, we continued to engage on campus—writing letters, getting petitions signed, and trying to force the president to meet with us to talk about this issue. We got nowhere. But as we were doing this, students were also organizing at Florida State. Then, a researcher at Greenpeace, who is an expert on the Kochs, told us about students at the University of Kansas who were also raising similar issues. In 2014, Lindsey Berger (now UnKoch’s executive director) and Suffolk University alumni Kalin Jordan co-founded UnKoch My Campus to establish an organization capable of supporting university stakeholders concerned about undue donor influence in research and media, and organizing support needed to protect their schools. When I graduated, I came on staff as well—first with just a lowly stipend because I really just wanted to keep doing the work, and now, as of 2017, as a full-time employee. LM: Were you able to see the gift agreement from George Mason? SP: No, we still have not been able to see a majority of the gift agreements. I will say that the Kochs and an anonymous donor gave $30 million to our law school in 2016. It became a big deal because of a stipulation that would rename the law school after Antonin Scalia—a ton of people raised hell about that. Eventually the university did publicly release that agreement. 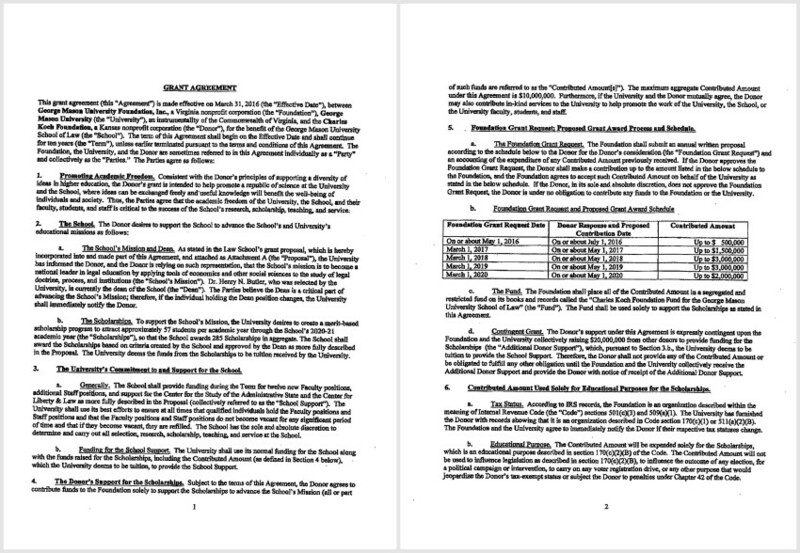 George Mason has been funded by the Kochs for a very, very long time. Since 2005, we have received over $100 million if you include the 2016 donation. We pulled these figures from the Koch Foundation’s 990 tax forms. We have not had access to any of the other agreements. Active students at George Mason are now in litigation against the university and the GMU Foundation in hopes of arguing that the foundation is a public body, and should be subject to the Freedom of Information Act. But we have not yet gone to court. LM: There are a number of difficult and nuanced threads running through this set of stories. There is the overarching question of the way foundations like the Kochs’ exist in the abstract, though with very concrete, day-to-day effects on campuses they are funding. Then, there is this question of transparency, oversight, and governance. One might think through what the “public” part of a public university means, and who has the authorization to be a part of that effective public. The ability to participate in the governance and the decision-making that protects academic freedom for both faculty and students clearly plays out in terms of both research and pedagogy. I’m curious if you can elaborate on the explicit conflicts here. It is explicitly limiting to have stipulations about what types of research are permissible or to know that somebody has the power to effectively veto one’s research and faculty hires, or shape the direction of the curriculum. It’s a fair logical jump to say that kind of stipulation is made to serve an agenda, right? SP: Right. You mentioned something very important about how stipulations might be tied to academic freedom. We don’t have access to many of the Koch Foundation grant agreements, but we have at least eight of them from different universities around the country. Something that is common to all of them is language that expresses interest in giving a sum of money over the span of a few years. But, to receive that next installation of funding, Koch wants to review the progress of the funding beforehand. LM: Phased grants are also not uncommon. With a large, multi-year grant you will receive the first installment and, upon successful completion or demonstration that the work is happening, get the next installment. SP: Exactly, but we have quotes from folks in the Koch network explaining that this is to ensure their agenda is being put forward. If they see something they don’t like, they will pull funding. The ARPA Journal call for submissions talks about how conflicts of interest can manifest in concerns for personal gain. Professors and staff know that if they are not focused on certain topics and fulfilling donor’s interests, they will not have funding for the next year. When the university takes on the creation of a new program and hires new people, and donors pull their funding, it’s the university that is left with that program and the responsibility for all the people that the initial gift expected them to hire. The burden is placed on the university—the donor can step away. LM: There is a clear difference between a grant that’s administered in installments upon successful completion of each phase and a gift that’s essentially holding research hostage. SP: Right, that’s how we talk about it as well. LM: It sounds as though what you’re describing is a ransom. LM: But you also raise this issue of personal gain in conflict-of-interest standards, which are formalized within research ethics reviews on campuses across the country, and through institutional review boards. Researchers have to declare any potential conflicts of interest by disclosing whether their research dovetails with their personal or families’ personal finances in any way, such that you might stand to gain something beyond the development of your scholarship. But that’s not the conflict that you were describing. What you were describing is a loophole in which, rather than a conflict motivating research with additional financial gain, research might be motivated by the threat of removing necessary finances. It’s research in fear of subtraction. SP: This is also what makes it so difficult. There are extensive mechanisms in place at universities to address conflict-of-interest issues. But this is a new issue that we need to address as well. I like the way that you described it as a loophole, because it’s an additional tier of potential conflict of interest. The majority of faculty-senate committees we know of that are actively working on this issue are conflict-of-interest committees reviewing mechanisms in place and trying to understand what could be added to address this problem we haven’t really grappled with before. A faculty member I talked to recently mentioned that the whole issue of a private foundation that serves a public university is making even those mechanisms unclear as well. LM: Which is another constructed loophole. I don’t know the history of these types of foundations, but I understand there are restrictions on what private donations public institutions can collect by virtue of being public institutions. There is a well-meaning logic here, especially understanding how underfunded our universities can be. But if it also produces another obscuring veil—another layer of not only paperwork and red tape, but a mechanism to bypass transparency—that becomes additionally problematic. SP: Right. At George Mason, for example, the foundation president describes their alignment with normal fundraising principals, such as respect for the confidentiality of the donor. I understand that, but those principles also conflict with the American Association of University Professors’ principles on how funding should be transparent at a university. I do sincerely believe that these institutional structures are well-intentioned in regards to the purpose of foundations, and I definitely understand, as a recent graduate, why we need more money in higher education. As you said, there are these two worlds that are both well-intentioned, but they are now conflicting with each other. Donors are finding loopholes to utilize the ways in which they conflict. I think the Koch network is brilliant and very strategic in what they do. SP: I can also elaborate on an example of conflict of interest that we identified at the University of Kansas. A professor who was working at the university within a Koch-funded center also happened to be the former chief economist for Koch Companies Public Sector, which is a lobbying subsidiary of Koch Industries. He was given a grant by Koch Industries to do research on the state’s renewable portfolio standard. He then used the research to lobby the Kansas legislature in 2014 that was in favor of repealing the renewable portfolio standard. So, they pushed back against renewable energy in Kansas. LM: That’s astonishing. For a number of reasons. It’s an excellent illustration of what I’m going to summarize as the inversion of the conflict-of-interest policy we set at schools. 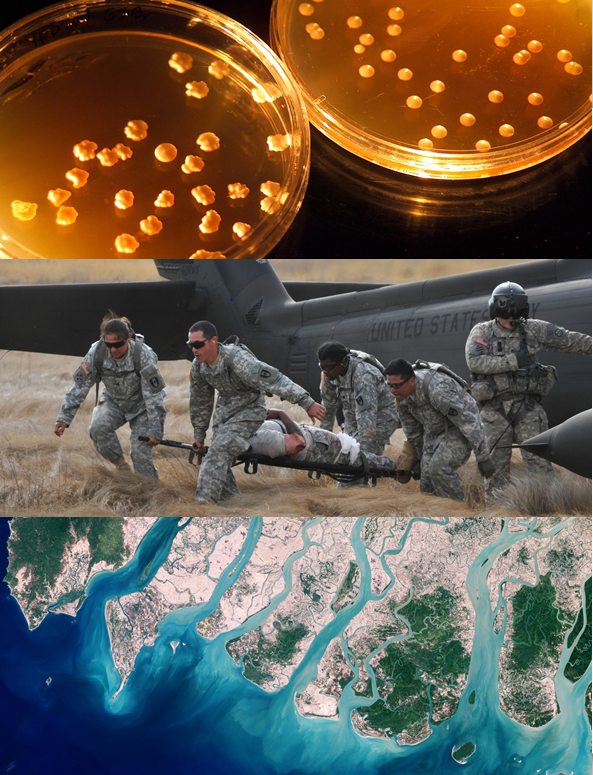 It doesn’t neatly fall into a faculty researcher’s conflict of interest because he or she is not the one benefiting, but instead, results from a kind of hostage scenario in which the threat of either removing or specifying what will be funded produces a different kind of conflict and directs benefits for the funder. And again, these are practices that have a logical place and a long history. Ethics reviews in research have a very long history. Also, it’s not an uncommon practice to conduct research for hire. You could hire a private researcher, consulting firm, or a non-profit think tank. In contrast, when research comes out of an academic institution, it carries with it the assumption of, both, rigor and non-partisan motivation. A study coming out of an academic institution is received very differently than one that comes out of a known, political think tank. And so, contracting academic research offers a different kind of power. SP: Absolutely. At George Mason, for example, we have the Mercatus Center. The Mercatus Center is our major Koch-funded think tank on campus. It’s a libertarian think tank and they don’t want to talk about how they accept state funding to support their work, so they love to highlight the fact that they are fully privately funded. Then why are they at George Mason University? The argument I would make is that they need the legitimacy of George Mason’s name when they take their research to Capitol Hill. That’s largely why I’m so passionate about this work…that’s my university and the integrity of my degree. As an alumna, that’s at stake. I think that’s a big reason students care so much about this. I don’t want to see my university turned into a lobbying firm for some of the most powerful men in this country. LM: I would love to hear your personal experiences as a former student in a heavily Koch-funded school. I am interested in the effects and the manifestations of this kind of funding in pedagogy. How is this experienced by students within the schools? Within the curricular agenda of the school, how does the funders’ agenda manifest in the classroom? SP: There is an article I can send you by Christopher Arndt, the author of The Right’s Road to Serfdom, which traces the libertarian movement from Hayek to Trump. In this book, Arndt describes his experience in a seminar in a summer program funded by the Kochs through the Institute for Humane Studies at George Mason many years ago. LM: So beyond research, you are describing a scenario within the context of the classroom in which academic freedom is limited. SP: Absolutely. Academic freedom for students to question, raise issues, and explore other ideas was largely shut down. Arndt said that if he had known that the Koch Foundation or Koch Industries was funding this seminar, it would have made a lot more sense to him why they didn’t want to talk about theory or have any type of constructive debate. The class was just there to tell him that regulation is awful, the government is horrible, and this is how you can get involved in making sure everyone believes that too. A year later, he approached me on campus and was like, “So Sam, I actually switched my major to economics and now every time I go into a classroom, I feel like I have to fact check everything I’m told. There is no debate in the classroom. There are no alternative perspectives taught in the classroom.” I’ve heard that from a ton of students at George Mason, from those who take lower-level economics classes all the way up to majors in the program itself. Some folks appreciate that. They went to George Mason to get a free-market economics degree, because they were already familiar with the school’s history and reputation. But my friend was just a local student. He didn’t go to Mason for a single perspective. He went there to be challenged, be presented with multiple theories, and decide for himself what he wanted to believe after college. LM: Many would argue that is the purpose of an undergraduate education. Certainly, most would argue that is the purpose of a liberal arts education, because it is hard to imagine a 17-year-old who has already established his or her political identity. SP: Right. There are plenty of quotes that I can send you in which Charles Koch himself says the reason he invests so much in higher education is that youth are the only ones still open to new ideas—that if we can get them when they are young and in college, we can change their minds. LM: We have a word for that. It’s called indoctrination. SP: Another reason this campaign got started at George Mason was because of an experience a friend of mine had in an environmental economics class. The course, which was required for students who were studying environmental studies, was based in the economics program. There was blatant climate change denial throughout the class. The professor told students that if they wanted to disagree with him on climate change, that they should get out and not come back. Koch Industries was essentially funding this department—the majority of Koch Foundation funding that doesn’t go to the Mercatus Center or the Institute for Humane Studies at Mason goes to the economics department. LM: Just to be on the record about one thing: obviously, so much of the information that you are able to gather on this topic is anecdotal or hearsay. That the stories exist, regardless of their veracity, contributes to a climate that’s not exactly conducive to critical, thoughtful inquiry or to personal educational growth. I’m not necessarily questioning the truthfulness of the stories. Rather, what I’m finding compelling, in a scary way, is that you are able to rattle off this many stories from different students, different peers. SP: Right, and like I said, there are plenty of students who really do appreciate the education that they get from the economics program. But as someone who just graduated and paid a lot of money to go to college, that’s not really what I went there for. 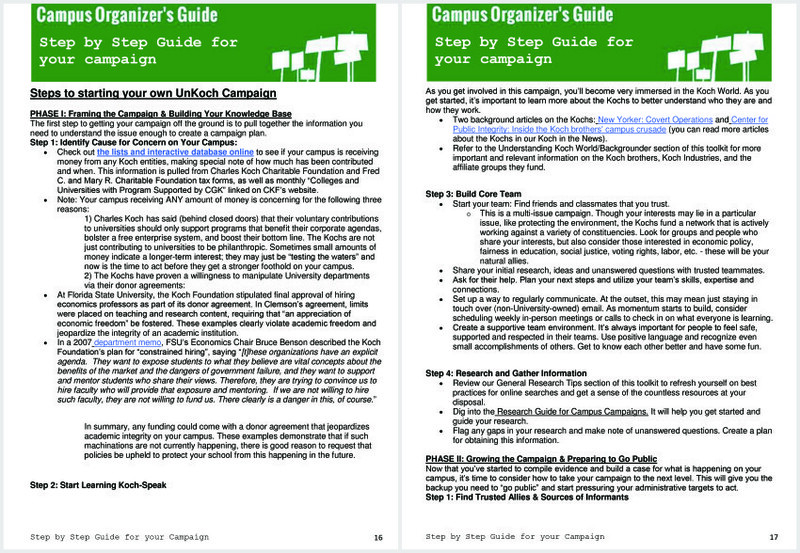 LM: I have up on my screen right now Unkoch My Campus’ Campus Organizer’s toolkit—a step-by-step guide offering practicable, actionable strategies.2 It includes instructions on how one would go about developing an awareness-building campaign and affect some change on a campus. We’ve talked a lot about what one can do within a campus. At a broader, more national scale, can you talk about the sort of strategies you guys are employing and their efficacy to date? SP: What we do at the national level is applied at the campus level in whatever way makes sense for that campus. At the national level, we spend a lot of time reviewing contracts that we do have access to. 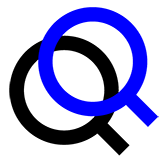 We provide an analysis of them that highlights their means of control and evaluates what is normal and abnormal. Similar to what we talked about earlier, a lot of this stuff is not super abnormal, but there are little loopholes that take it to the next level. LM: It’s a little like the distinction between that which is illegal versus that which is unethical. Something may not be in violation of any university policies or any public funding policies, but it isn’t within the spirit of the policy either. My colleague Ralph is working on a database that tracks funding streams over time. That’s a resource we hope to provide to students and faculty or to any other stakeholder. We also do a lot of media work; we want everyone to see this research and be able to use it for their own efforts. We love being able to provide organizing advice, particularly to students—because they are the ones raising hell and really organizing on campuses. LM: It seems that the trick to doing anything on this scale is to translate the strategic into the tactical. That is something that your toolkit makes very clear. Leah Meisterlin is an urbanist, architect, and Assistant Professor at Columbia University’s Graduate School of Architecture, Planning, and Preservation. Broadly, her work engages concurrent issues of spatial justice, informational ethics, and the effects of digital technologies on urban research. Samantha Parsons is a co-founder of UnKoch My Campus. She provides university stakeholders with the support needed to investigate, expose, and launch strategic grassroots campaigns to address undue donor influence on their campuses. Her research interests include university policy development, institutional funding models, the role of the academy in a democratic society, and critical conflict resolution.